Successfully Added Bluetooth Rearview Mirror with Mic and Stereo Speakers to your Shopping Cart. This Bluetooth Rearview Mirror is the smarter, safer, and hands-free way to make and receive calls while driving. Just snap it over your existing rear view mirror and you can keep your eyes on traffic while talking away through the built-in mic and stereo speakers. For a safer drive, this Bluetooth Rearview Mirror offers convenient hands-free calling that can be set up instantly. Just snap it on your current rearview mirror and the screen embedded inside will display (unobtrusively) the name or number of callers. Even better, you can pick up and make calls with the press of a button, with functions like redial, reject calls, and voice dial included. What else makes this Bluetooth Rearview Car Mirror really stand out? Built-in Mic and Stereo Speakers: No more fiddling with your phone while driving, this Bluetooth Rearview Mirror is completely hands-free. Just speak normally and the powerful mic will pick up your voice while the stereo speakers will clearly broadcast your caller's. 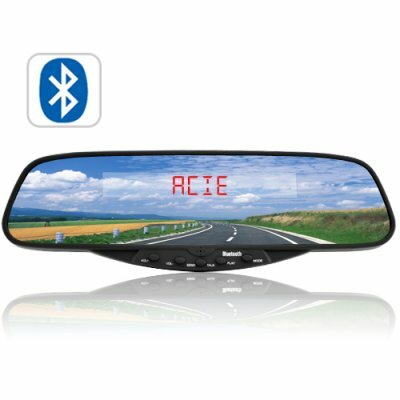 Audio Transfer: For those who demand privacy when other passengers are in the car, the Bluetooth Rearview Mirror allows you to have the sound transferred to your connected phone - without having to disconnect the Bluetooth connection! Also included is a handy earphone slot for more private calling options. Price: High quality at a factory-direct price, this Bluetooth Rearview Mirror is the perfect car accessory to not only to improve the safety of you and your passengers, but also to enhance your audio enjoyment. Available in our warehouse now, order today and we will express ship it tomorrow, guaranteed! Brought to you by the leader in wholesale electronics and car accessories - Chinavasion. Does this car rearview mirror display caller name? Yes, but first you will need to send the contact details through Bluetooth to the device itself. So I can use this as a regular rearview mirror? Absolutely. Best of all, it fits right over your existing one! If you are looking for a handsfree bluetooth device for your car which really does do exactly what it says on the tin, then this is the product. Easy set up, crystal clear voice reception and transmission. You really cannot go wrong with this device. Not only that the delivery service from the company in southern China is second to none. Ordered it and recieved it within 4 days !! wow. The sound is good and its easy to use.